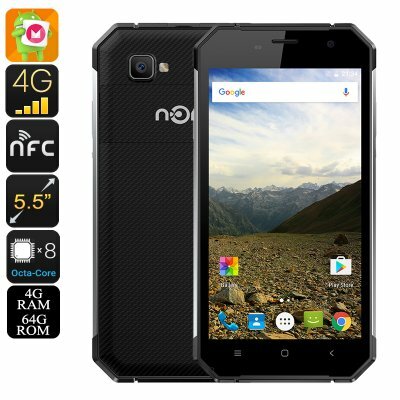 Successfully Added HK Warehouse Nomu S30 Rugged Smartphone - IP68, Gorilla Glass 3, 2.0GHz CPU, 4GB RAM, OTG, 5000mAh Battery (Silver) to your Shopping Cart. Nomu, a new name in the Smartphone market have made a big splash with their latest affordable rugged phone, the S30. This high end octa-core smartphone boasts an impressive 2.0GHz MT6755 processor, 4GB of RAM and runs on the Android 6.0 OS on top of that is has protection from all hazards with its IP68 rating. The S30 is superbly protected from water dirt and drops thanks to its IP68 rugged qualities, tough rubberized outer and hard as nails Corning Gorilla Glass 3 screen. Able to withstand submersion in a meter of water for up to 30 minutes this waterproof Smartphone eliminates worries with its tough outdoor design. Thanks to a powerful chipset the Nomu S30 can handle the latest Android games and will effortlessly keep pace with multitasking and have usage. A 5000mAh battery brings exceptional usage times of up to 30 hours and having Quick Charge technology means that when it eventually does need recharging you won't have to stop in once place for long as it is 45% faster to recharge than traditional devices. Added to all this is the OTG functionality, which means that massive 5000mAh battery that can double as a power bank to keep your other gadgets running when your away from the mains. Protected by a seal back plate are two 4G micro SIM card slots and a micro SD card port. This allows for communications across a wide range of frequencies on the fastest networks available so streaming HD movies, downloading data or updating your Facebook page with pics from your latest adventures will be super fast. Additional you can complement the 64GB of onboard memory with an additional 32GB of storage so storing all your vital media and data on one portable device won't be an issue. Front and rear cameras on the Nomu S30 deliver 13MP and 5MP images respectively. although with interpolation you can enjoy 16MP photos from the stunning Sony rear shooter that enjoys an F /2.0 aperture and a 6P optical lens so you'll get sharp and clear pictures even in low light. With all this and more the Nomu S30 rugged smartphone is a great option for all and come with 12 months warranty, brought to you by the leader in electronic devices as well as wholesale rugged smartphones..